Thank you all for your thoughtful comments and emails on my last post. It means a lot to hear that I am not sinking into oblivion ;). However, I have not just been sitting around gazing at my (rather squidgy) navel, and in fact, have been working my backside off the last few months to pull together some rather exciting things. The first of those coming to light is our new book in partnership with the insanely clever Rachel Coopey of Coop Knits. Crochet Yeah is a collection of 6 accessories patterns in the utterly gorgeous Socks Yeah yarn. Joanne and Rachel will be launching it at Unravel, but you can catch a preview below and preorder the print book here and the eBook here. In future, a lot of the crochet tutorials that I traditionally posted here will move to The Crochet Project website. Joanne has already started posting tutorials there and has written an excellent post on how she uses washi tape to manipulate stitch patterns. 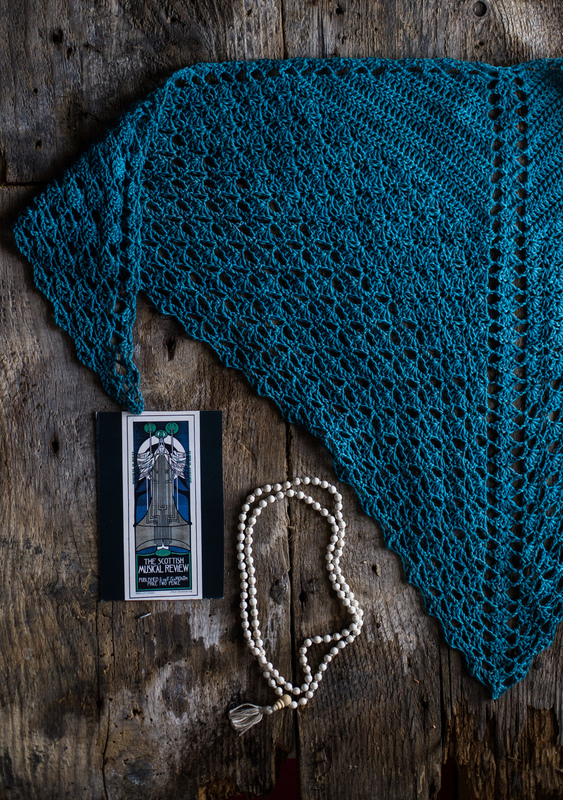 I keep coming back to this Rheinlust shawl by Melanie Byrd. I need to keep working on socks in my free time (you know, for the Christmas gifts I haven't finished yet!!! ), but my fingers are itchy. I am still making sourdough bread almost daily. I tried this method the other day and it was great, but it also really outlines a great way to make sourdough part of your day. The only difference for my own method is that I feed my starter earlier, then start working on the dough when I turn the oven on at about 4:30 to start prepping dinner. It goes in the fridge when I head upstairs at about 10. The clocks change always seems to coincide with the ramping up of all the activities - Halloween, Village Barbecues, Bonfire Night, Parent Teacher Meetings, Village Christmas Fairs, Christmas Shopping (ugh), Thanksgiving Prep...the list seems to go on with every moment scheduled down to the minute and family and working life organised with such precision, I feel like we need to hire a logistics company to come in and tell us who needs to be where, what and when. And then of course comes the cold. We've had a fog settle on the valley we live in and its been here for 2 days. Ugh. Have I also mentioned that my wood burning stove in the studio has been condemned? So, just imagine me sitting typing this wearing - a knit hat, a bulky weight crochet cowl, a knit + fleece lined jumper of Kevin's, handwarmers, a blanket on my lap and a hairy bearded collie sleeping on my feet...and it is only November! A winter in this freezing place may not be possible, but I plan to hold out as long as I can. Step 1: find something less wet and smelly than a bearded collie for foot warmth. I know I have been making all the socks, but in truth they are accounted for as Christmas gifts, so I needed something quick and easy for myself to make. Fortunately, this need also coincided with our Crochet Project Release of Saunders - an aran weight sock pattern by Joanne! Its a lovely quick pattern. I started my pair when I was waiting for potatoes to boil last night for dinner - 20 minutes and I am about half way through with the leg. I am making my pair in Libby Summers' Fine Aran and I think I will go for a contrast heel and toe. The pattern is super quick and sized from baby to size 13, so I may be whipping out a few pairs for Christmas for others as well. I can't wait to finish them...the beardie is cute, but did I mention the smell? Pulling a book together, even if its just 5 patterns, is a lot of work. Its less about the designing, because that is a given, its all of the little things that take up the time. I have a checklist I use when pulling together patterns and The Crochet Project books and in the run up to publication and Yarndale, it looked like we were ahead of the game. All the flat shots of the shawls were done, the text was mostly edited and laid out, just some final tweaks here and there and then we were done. And then came the tweet "Could we get a couple of washing line shots to show all 5 shawls together, please?" This task hadn't made it on my list and I had simply forgotten about the need to get a photo of all 5 shawls together. While my washing green does have excellent views, it is walled and it can be a bit of a struggle to get the right angle on larger objects. I needed an alternative plan. Out came two tent poles, some cord and tent pegs and off I went into the cow field. It took a couple of tries to get it right. The weight of the shawls needed some counter traction. The I erased the guy lines in lightroom to get more of a "washing line" and less of a "using tent poles to show off shawls" effect. As dramatic shawl photos go, I am quite pleased, even if the farmer said something to the effect of "Every time I am up here, you are doing something odd in that field". Hahaha! A List for A Wednesday (On a Thursday) Shawls Edition! Note to self: best not to launch anything during school holidays. Gah! So behind! The big news is that The Shawl Project: Book Two is available to download immediately as an e-book (pdf) for £10 or pre-order in print for £12 +p&p. Print copies will be dispatched within two weeks in the order they were bought. The link for the ebook takes you directly to paypal to complete the transaction. I have written a wee bit about developing Fireside as a design on The Crochet Project blog this morning. Joanne has also written about Humphrey there and on her own blog, if you feel like totally geeking out on our design process. The Acer CAL kicked off last night in the LoveCrochetCAL Facebook group as well. The stash photos alone had me loading up my lovecrochet.com basket with wool. If you are looking to add to your stash for Acer or any of the shawls, don't forget you can sign up for the Love Crochet mailing list and get 10% off! As for me, I will be wearing all the shawls all day, huddled next to the heater in the studio. Its 10am and I can't feel my fingers...brrrrrrrrrrrr. As I type, the freshly printed copies of Shawls 2 are winging their way to Joanne. The ebook is getting its finishing touches and will be available soon. If you are dying to get your mitts (virtual or otherwise) on a copy, sign up to the Crochet Project newsletter to get the first news on where and how to get your copy. Over the next week, shawls will take over this blog, Joanne's as well as The Crochet Project. So prepare for some major shawl geekage. And if that still isn't enough shawl action - you can join in the Acer CAL and get hooking straight away. Despite their importance to my work, republishing old patterns from magazines does tend to be last on my todo list. Have a huge backlog to republish and despite my best efforts, I just never manage to get to them. However, when I knew one of my favourite models was back from uni for the summer, I made a point to scheduling a shoot so I could get some of the garments out into the world. So, last night we headed down to the gorgeous Cardross House for a quick sunset photoshoot of this cardigan plus a couple other garments I have scheduled for re-release. Originally published in Simply Crochet Issue 26, Twist It is a super chunky-weight cabled cardigan. Sized from bust 34-48, its generously sized and is the perfect chunky, curl up by the fire cardi. The construction is a basic raglan, worked in one piece from the bottom up and then joined with the sleeves which are worked separately. The yoke is a pretty straight forward and quick decrease to the neck. If you need help with the cable, I wrote this cabled crochet tutorial with this pattern in mind. The pattern is available on ravelry and lovecrochet.com. The photos were part of a gorgeous photoshoot at Cardross House last night in beautiful autumn sunshine. I can't wait to show you the rest of the photos, so here is a wee sneak peek of what else is coming. The next month is chocked full of deadlines. Obviously life is always full of deadlines, but normally they are spaced out to include a few weeks respite, but September will be building to a fever pitch, culminating in the Crochet Project stand at Yarndale and the launch of Shawls 2. In the lead up to any launch, I spend about 50% of the time freaking out. I think its partially my pessimistic nature and the fact that I rarely get the working time I need to get things done that sends me into a tailspin. Joanne regularly receives freak out messages from me to the effect of "OMFG I am never going to get everything done!" We always do, so I should probably stop freaking out, hey? This ARE coming together for Shawls 2 and while I can't show you much else, how about a couple of sneak peeks at 2 of the designs that will be in Shawls 2, both designed by Joanne. There will be 6 shawls in total in the book which will be available exclusively to those attending Yarndale. Everyone else will need to wait a couple of weeks after that to get their hands on it. ..now off to freak out about something else! My business started when my youngest son was three months old. I'd taken voluntary redundancy from a civil service job 6 months before and one day the money ran out and I wasn't sure how I was going to buy groceries for my family. As I sat at my kitchen table, I looked around at things I could do with a 6 month old, an 18 month old and a 4 year old at home with no childcare. I'd dabbled in making crochet hats previously, but that day a business was born. There is no question that working from home is pretty dreamy, but its not with out its challenges. Being at the house means that I am always the one who has to deal with house related appointments, the one who takes the time off for holidays and school-related events and where the responsibility for dinner lies. Its mostly great, but often frustrating. However, after 4 years, I wouldn't have it any other way. Register as soon as you can after starting your business. At the latest, you should register by 5 October in your business’s second tax year. Even if you aren't making any money, you should still register as you can claim tax relief on your household expenses as you build up your business. HMRC has a guide here. Also, make sure you check out any other tax relief options if you are paying for childcare or making a loss as it may effect your eligibility for Tax Credits. You also need to keep track of your accounts. This is something that I wish I had done earlier, as for most of the last 4 years, I would just download my bank statements on the 30th of January and start going back through 12 months of receipts 24 hours before my taxes were due. Thanks to Kim (read her blog, if you don't already), I found Kashflow, which importantly, works on my rather slow internet and is very easy and intuitive to use. Recently, European legislation was brought in that means that sale of digital goods is now taxable based on where the buyer lives. What this means that if you sell a pattern to someone in the European Union, you are responsible for ensuring the tax is paid on that sale, no matter where you live. One option is that you can register to pay this tax yourself. However, as you get started selling patterns, my advice would be to stick with a platform that handles VAT MOSS for you, such as Etsy and Ravelry. For more on VAT MOSS, the Digital VAT Group on Facebook is a great place to start. I started my business with 3 very little children at home with me all the time. I quickly realised that this wouldn't work well for the concentration needed to write and grade patterns and deal with the day to day runnings of my business. Kevin and I worked on a plan where I would work when he came home and on weekends and I also used every ounce of good will from friends who offered to watch the kids so I could work. At first it wasn't much time and it was VERY stressful, but it was crucial to moving things forward and building a business. The moment we could find a childcare situation that worked for us, we took it. Even though it would cancel out any profit I made for the first 3 years of my business, we saw it as an investment in my future work. Maybe you don't have kids, maybe your design gig is on the side of a full time job or maybe childcare isn't an option for you, but the basic principle is the same, you have to make space for your design work in your life. Make it a priority on your list of things to do (its WAY above doing the laundry and housework on mine) and keep it there. Its not just about creating mental space, but physical space to work is crucial. Even if its a corner of your bedroom or at the kitchen table, make a space that is your work place. You may have to pack it up every day, but having a place where you feel creative and productive is crucial. Have the things you need together so you don't have to use your precious working time looking for them. My best and most productive days at home are when I follow a routine. I get up, I get dressed, I walk the dogs, I set my priorties for the day and then I work. I definitely take breaks to make coffee or switch the laundry over, but I stick to a working for the X hours I am child free and rarely do household tasks in my working day. I also make sure that I am dressed and ready to work. I also take an overview of my week and look at when I need to be available for kids or have appointments and think about what work I can take with me to do while we are out. Swatches and mindless crochet are always in my bag and a notebook always comes with me to draft posts or patterns on the go. When I left the civil service, I really felt like I had to work 9-5 as I had done for my entire working life. However, I have become an ardent supporter of doing the work when I am best at it. I am best at writing in the morning, so I do that before the kids are up. I also schedule photography for the afternoon when the light is better. I hit a wall after about 5pm, so designing into the late hours isn't a solution that works well for me, so I rarely even crochet in the evenings. Being the one who works at home usually also means that I am the one who takes on the majority of the house and kid related tasks. If there was one friction point in Kevin and my relationship, this is it. Being the one at home means that its my work day that is interrupted when the electrician wants to come by, a kid needs to come home, etc. There is no question that this is super frustrating and I don't take it well when its my deadline that is always the one that is missed. We've worked hard over the last 4 years to make sure we share out these tasks. Where possible, he takes the time off with sick kids or we swap half way through the day. If I have had my work interrupted for most of the week, he will take the kids out for a full day at the weekend or clean the house by himself so I can catch up and school holidays are split evenly between the two of us. We share out the household tasks and try to make a plan each week so that we know who is doing what, that way there is no ambiguity (and the related resentment) as to who is responsible. I realised recently I have become the person who is overly chatty at the post office, the butcher, the supermarket...well, everywhere. There are weeks when the only time I leave the house is to go to the bus stop to collect the kids from school. I am a pretty social person, so working at home all the time can get me down. I am luck to live in an area with lots of other work at home folks, so I try to make a point of scheduling at least one meet up during the week so that I can talk to another human being. This is also where online life really comes into its own and I am frequently messaging my business partners to talk shop. And I am off to do just that! See you later! Over a year since it was designed, tech edited and photographed, I bring you, Geo Tiles. Designed for The Crochet Project, but it wasn't a great fit into our pattern collections, so after holding on to it for a year here it is as an independent release (the photo of Joanne was taken at 2014's Woolfest!). I am becoming increasingly picky about crochet colourwork. I am learning that to get the look I like, the edges of the colourwork need to be squared. This creates (in my eyes) the neatest finish. You can download Geo Tiles now. Perhaps the biggest discussion going on in the Deramores Cedar River CAL group on Facebook is what colours to use. Man, I am with you, choosing colours is hard. I am notoriously picky about (well, everything) but especially colour. I think that its one of the reasons I stick so closely to a strong pallet is that I know what I like and I don't want to alter it in ANY WAY, but...you know, not everyone wants to use mustard in every design (who are these strange people?). I thought I would show you some of the development of the colours in the blanket. The Cedar River blanket was originally intended to be a rainbow extravaganza. This is the original mood board I sent to them as part of my proposal. I still think the rainbow would be incredible, but at the time I was making it, one of the blues was low on stock and the rainbow had to be shelved. Heading back to the drawing board, I then began playing with the colours. I find it very hard to decide upon colours and one of the main reasons I fall terribly behind in my work is that I have a tendency to remake things because I am unhappy with the colour combinations. This design was no exception...I made about 9 different variations, often making 2 or 3 of the same block to get a sense of how they fit together. My original plan was to have alternating squares as shown on the left. This is pretty common in string quilts and in fact, we were just about on the point of putting the blanket together when we made the decision to have the squares all the same. This is what creates the strong geometry of the finished design. So, how then do you go about choosing colours...for me, I think its about finding frame of reference...something in my house or life that I love and matching that. Design Seeds is another great colour resource. I hope that helps the indecisive among you! The full range of the Deramores Studio Range is here and you can find the 2nd part of the tutorial for making the blanket here. Who doesn't love new stitches to play with? Stitch dictionaries are one of my go to sources of inspiration for new designs. I just love seeing the versatility of what crochet can do. One of my favourite stitches is the crossed shell. I used it in the Waterfall Shrug in Hook, Stitch and Give and its a stitch that I continue to be drawn to in my design work. Its one of those stitches that is a total pain to establish, but once you get it, its very easy to just keep going, with enough repetition to make it easy to remember, but enough interest to keep you going. This is an excellent stitch for things like stoles and scarves. The pattern calls for a repeat of 8 stitches + 5 for the beginning chain. For this example, ch 29. Set up Row: 3tr in the 5th ch from the hook (tch counts as 1tr and 1ch), miss 3ch, [1dc, miss 5ch, 3tr in next ch, 2ch, working back in to the 2nd ch missed, 3tr, miss 5ch from the stitch just made] twice, 1dc, miss 3ch, (3tr, 1ch, 1tr) into ch. Turn. 2 completed CS sts and 1 half CS at either end. Set Up Row: Step 1: Make 3 tr in the 5th chain from the hook. Your turning chain counts as 1 tr and 1 chain. Step 2: Miss 3 chain and make 1 double crochet in the next chain. Step 3: Miss 5 chains and make 3 trebles in the next chain. Step 5: You are now going to work back over the trebles you just made by working 3 trebles into the 2nd chain you missed when you missed 5. Make sure to work these stitches loosely, as you don't want to pull the other cluster of trebles down. Step 6: Miss 5 chains from the cluster you just made (or 1 stitch from the first set of trebles you made). Double crochet 1. Step 7: You will now repeat Steps 3 - 5. Step 8: Miss 5 chains from the cluster you just made (or 1 stitch from the first set of trebles you made). Double crochet 1. Row 1: 1ch (does not count as a stitch), 1dc into tr, 3ch, miss 1ch and 3tr, 1tr into dc, [3ch, miss 3tr, 1dc into 2chsp, 3ch, miss 3tr, 1tr into dc] twice, 3ch, miss 3tr, 1dc into chsp. Turn. Step 1: Chain 1. 1 dc into the 1st treble. Step 2: 3chains, miss 3 trebles, 1 treble into the dc in the row below, 3 chain, miss 3 trebles, 1 dc into the 2-chain space at top of the shell. Step 3: 3 chain, miss 3 trebles, treble into the dc, 3 trebles. Step 4: Miss 3 trebles, dc into the 2-chain space at the top of the shell stitch, 3 chain, miss 3 trebles, 1 treble, 3 chain, miss 3 trebles, 1 dc into the 3rd chain of the beginning chain. Turn. Row 2: 1ch (does not count as a stitch), 1dc into dc, miss 3chsp and 1tr, 3tr into chsp, [2ch, 3tr into missed 3chsp, 1dc into dc, miss 3chsp and 1tr, 3tr into 3chsp] twice, 2ch, 3tr into missed 3chsp, 1dc into dc. Turn. Step 1: 1 chain and make 1 dc into dc. Step 2: Miss next 3-chain space and treble. Work 3 trebles into the next chain space, chain 2. Step 3: Crossing back over the stitches you just made, make 3 trebles into the 3-chain space you just missed. Step 4: dc into the next dc. Step 5: Repeat steps 2-4 across the row, finishing with a dc into the last dc of the row below. Turn. Row 3: 6ch (counts as 1tr and 3ch), miss 3tr, 1dc into 2chsp, [3ch, miss 3tr, 1tr into dc, miss 3tr, 1dc into 2chsp] twice, 3ch, miss 3tr, 1tr in dc. Turn. Step 1: Chain 6 - this counts as 1 treble and 3 chains. Step 2: Miss 3 trebles, dc into the 2chain space at the top of the shell. Chain 3, miss 3 trebles and treble into the next dc. Step 3: Continue working this bridging pattern across, with dcs into the top of the shell stitches and trebles into the dcs in the row below, with 3 chain spaces bridging the gaps between the stitches. Step 4: Treble into the final dc of the row below. Turn. Row 4: 4ch (counts as 1tr and 3ch), 3tr in tr, miss 3ch, [1dc in dc, miss 3ch and 1tr, 3tr into 3chsp, 2ch, 3tr into missed 3chsp] twice, 1dc into dc, miss 3ch, (3tr, 1ch, 1tr) into 1st ch of turning chain. Turn. Step 2: Make 3 trebles into the first treble. Step 3: dc into the 2-chain space at the top of the shell. Step 5: [miss the 3-chain space and treble and work 3 trebles into the next 3-chain space. Chain 2. Working back into the 3-chain space you just missed, make 3 trebles. Dc into the 2-chain space at the top of the shell] twice. Step 6: miss 3 chains and work 3 trebles, 1 chain and 3 trebles into the 1st ch of the turning chain of the row below. Turn. Work Rows 1 - 4 as many times as required. Finishing on an even row gives the crochet a nice even finished edge. Its funny how some designs need to percolate before they finally see the light of day. I've always had a thing with quilts and really love how both modern and traditional quilters play with pattern and colour. When I was planning Hook, Stitch & Give, I had this idea to do a quilt block inspired blanket. Originally, the squares in the Granny Chevron blanket were going to be corner to corner blocks, but a last minute conversation with my best friend (who also made the blanket in the book) made me think that maybe granny squares would be a better choice. Well, this blanket wouldn't get out of my head...and I am not really a blanket person, suffering from a severe lack of interest in repetition. However, when the opportunity came to work with Deramores, I knew that finally my idea of mixing quilt blocks and crochet was going to come to light! So, about the blanket - its made from corner to corner blocks that are joined in my favourite method, which is a double crochet border and through the outside loops join. In this blanket I really like how the white border forms negative space through the intersections. The yarn is Deramores Studio DK, which is a simply lovely and super affordable yarn to work with. Its labeled as anti-pilling and so far its been just that. The colour range is huge and I will be using it again, which is rare for me to say about a 100% acrylic yarn. The CAL is running all this month. Get the pattern for free here where there will also be weekly step by step tutorials, join the CAL Facebook group here and you can also buy yarn packs here. Yay! Hexagons are a fun and versatile crochet motif that can be used for a variety of uses including blankets, table runners, doilies and potholders. Once you have the basics down, you can change the colours or stitches in the pattern to create designs that are uniquely your own. This tutorial is based on making 7 haxagons, but really, you can make as many as you like and join them. Next Tuesday, we'll look at half hexagons to neaten the edges. Each motif measures 15cm/6” across using a 4mm/US 6 hook. Gauge isn’t crucial to this pattern, but will effect the size of the final object and the amount of yarn used. Step 1: ROUND 1: Start with Col A and a magic loop. Step 2: Chain 3 (this counts as 1 treble stitch). Step 3: Working into the centre of the magic loop make 1 treble. Chain 2. Step 4: Continuing to work into the centre of the magic loop, treble 2, chain 2. Work Step 4 a total of 5 times. You should have 12 treble stitches including your 3-chain at the beginning of the round. Step 5: Join with a slip stitch into the top of the 3-chain that started the round. Step 6: Round 2: Chain 3 (counts as 1 treble), treble in the next stitch. Step 7: Work 1 treble, 2 chain and 1 treble all into the 2-chain space. Step 8: Work 1 treble into the next 2 stitches. Work 1 treble, 2 chain and 1 treble into the 2-chain space. Work Step 8 a total of 5 times. Step 9: Join with a slip stitch into the top of the 3-chain that started the round. You should have 24 treble stitches including your 3-chain at the beginning of the round. Step 10: Round 3: Chain 3 (counts as 1 treble), work treble into each of the next 2 stitches. Work 1 treble, 2 chain and 1 treble all into the 2-chain space. Step 11: Work 1 treble into the next 4 sticthes. Work 1 treble, 2 chain and 1 treble all into the 2-chain space. Work Step 11 a total of 5 times. Work 1 treble into final stitch of round. Step 12: Join with slst into the top of the 3-chain that started the round. You should have 36 treble stitches including your 3-chain at the beginning of the round. Step 13: Round 4: Chain 3 (counts as 1 treble), work 1 treble into each of the next 3 stitches. Work 1 treble, 2 chain and 1 treble all into the 2-chain space. [Work 1 treble into each of the next 6 stitches. Work 1 treble, 2 chain and 1 treble all into the 2-chain space] Work the sequence in  a total of five times. Make 1 treble into each of the next 2 stitches. Join with slst into the top of the ch-3. . You should have 48 treble stitches including your 3-chain at the beginning of the round. Step 14: Round 5: Chain 3 (counts as 1 treble), work 1 treble into each of the next 4 stitches. Work 1 treble, 2 chain and 1 treble all into the 2-chain space. [Work 1 treble into each of the next 8 stitches. Work 1 treble, 2 chain and 1 treble all into the 2-chain space] Work the sequence in  a total of five times. Make 1 treble into each of the next 3 stitches. Join with slst into the top of the ch-3. . You should have 60 treble stitches including your 3-chain at the beginning of the round. Step 15: Round 6: Chain 3 (counts as 1 treble), work 1 treble into each of the next 5 stitches. Work 1 treble, 2 chain and 1 treble all into the 2-chain space. [Work 1 treble into each of the next 10 stitches. Work 1 treble, 2 chain and 1 treble all into the 2-chain space] Work the sequence in  a total of five times. Make 1 treble into each of the next 4 stitches. Join with slst into the top of the ch-3. You should have 72 treble stitches including your 3-chain at the beginning of the round. Try to work into as long of lines as you join. If you are joining in rows, work the longest row possible first, then join the sides, or as in this example, work around one hexagon first and then join the sides. Joining Step 1: With Col B, align the hexagons you want to join with WS facing, working into the inside loops only, dc into each ch and stitch across the side. (Alternate photo Joining Step Alt). Joining Step 2: Bring the next hexagon to the adjacent edge of the central hexagon. Join as before, working into the inside loops of the ch and dc sts of each of the hexagons you are joining. Joining Step 3: Continue in this manner until all of the hexagons are joined to the central hexagon. Joining Step 4: Working from the centre out, join the other hexagons together. When you reach the edge, continue around the outside of the hexagon, working into the chain spaces and both loops of the dc to create edging. Originally published in #Crochet magazine. Sometimes I feel like such a tease. So much of what is happening in my day to day has to be kept secret and you all only get glimpses of the current projects and upcoming work. You may recognise my latest design from various snippets that I've posted on Instagram and in my Simply Crochet column over the last few months. Well, finally, today is the day you get to see the full shebang! After the, quite frankly overwhelming, response to The Shawl Project, Joanne and I wanted to give you a bit more in between Book 1 and the autumn release of Book 2. Spun Gold is a beginner level project and a great introduction to shawl making, while still being interesting to make. You can use any wool for this, as instructions are given to working for any size. The sample uses 1x 100g hank of 4ply...gorgeous Babylonglegs 4ply no less. Its become my perfect spring shawl - small enough to not be too warm, but still a welcome addition to the cooler days* we've been having. Worked end to end, this is the perfect shawl for making in that special hank of yarn no matter the weight. 24 dc sts measures 10cm/ 4” and 1 patt rep measures 5.75cm/ 2.25” tall using 4mm hook or size required to obtain tension. Huge thanks to Elly Doyle for her mad sample making skillz! * this is actually an understatement. I can't currently feel my fingers. 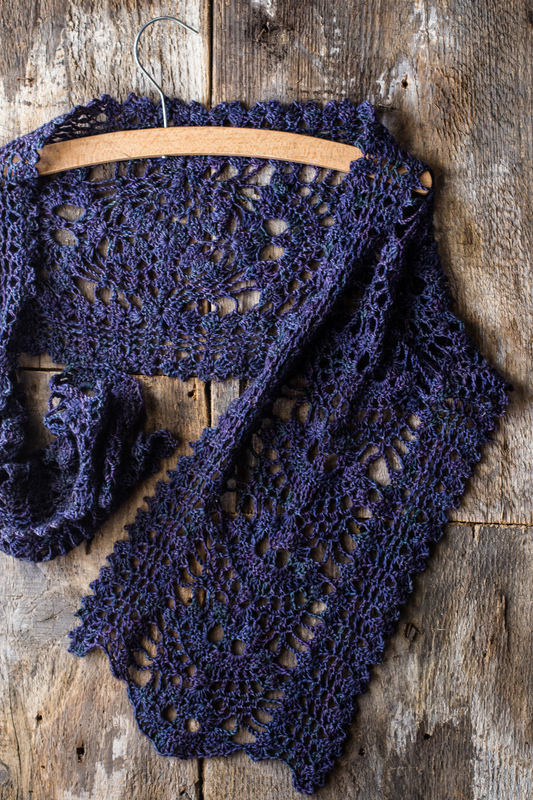 The Shawl Project is Live! Its a week of 2 birthdays, a trip to London, Easter break, and the arrival of my mother. I envision there will be a lot of coffee drunk over the next 7 days! 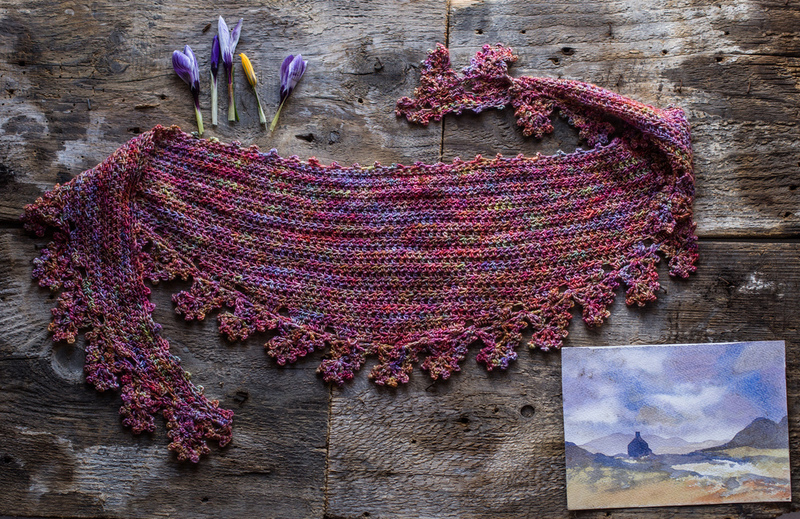 If that wasn't enough today marks the release of The Shawl Project Ebook. Six gorgeous patterns, all using 100g of 4ply yarn. Joanne has written fantastic instructions for not only making, but designing your own shawls. Now, go forth and crochet. Trends are funny things. One minute its blankets the next its a granny poncho. Notoriously hard to predict, there is an entire industry set up just to forcast whats next in the world of colour, fashion, future, tech, you name it. Deramores, the online yarn retailer, has thrown its hat into the mixed and asked a number of us what we see as the next trend in the world of knitting and crochet. One of the biggest changes I have seen in the last year has been the move toward more people making garments. Sales of Pleated Cardigan and Arucaria have been incredible and more and more projects are popping up on the garments from Hook, Stitch & Give and Simply Crochet than I ever have seen previously. While I can't point to an exact reason for this shift, my gut says its two fold. Over the last few years, crochet saw a massive resurgence, with large numbers of people learning to crochet and "How to Crochet" being one of the most searched phrases on Google. Crochet Camp on Facebook started as a group of about 500 and now has a whopping 5,700 members. As people have been hooked by crochet (har har), my suspicion is that they have moved through the stages of projects, from simple homewares and blankets to more complicated accessories, with many people wanting to take it to the next level of garments for themselves as well as kids in their lives. Garments are definitely a big commitment and can take more skill to get something wearable at the end. I also think that the DIY and Make it Wear it trends in fashion have impacted on those of us whose main craft is crochet. We have seen in sewists and knitters make gorgeous clothing and we want the same. Fortunately, many designers have recognised that trend and there has been an upsurge of beautiful and wearable crochet garments available, across magazines and independent releases. 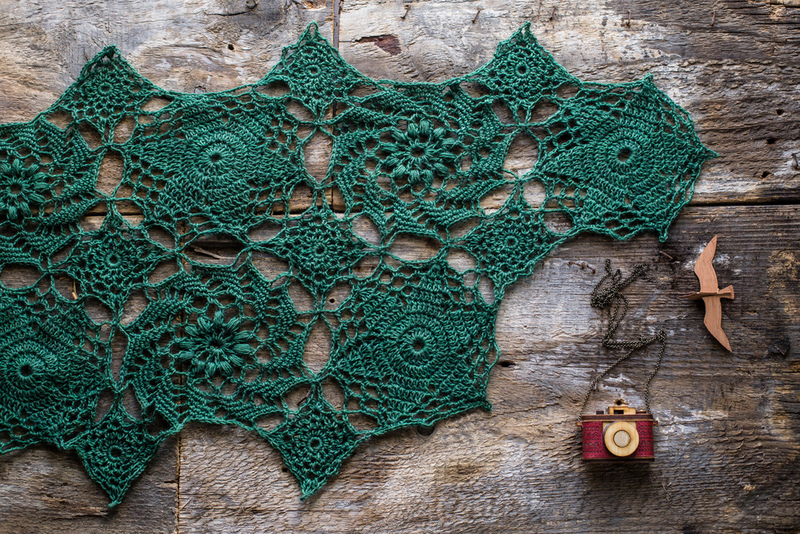 I think its a really exciting time for crochet with gorgeous thoughtful designs coming to the fore. Garments are expensive to make, and Deramores is launching a competition to win £500 worth of yarn. You can find the full details and the other trends picked by some fantastic bloggers here. While the digital release of The Crochet Project's Book, Shawls, is still a few weeks away we are hopefully going to print with the book this weekend in preparation of Edinburgh Yarn Festival. In it you will find 6 gorgeous 1 skein shawls, all designed by Joanne. Each has a different construction and highlights the beautiful hand-dyed beautifully. The printed book also comes with a chapter on the ins and outs of construction, so whether you are looking to design your own shawl or just make beautiful things, it will be the book for you. The patterns are available exclusively at EYF, but then will be released online in the coming weeks. But enough talk, how about a peek at the shawls? The are even more beautiful in real life, so if you are at EYF, do come find the stall to give them a squish! Well, my glorious puff stitch hexagon bedspread didn't work out. I tried, I tell you. I had all the best intentions. I carried my yarn and hook with me everywhere I went, but after making about 6 little hexies, I simply couldn't make any more. I simply can not make motif-based blankets (I even roped my BFF into making the one in Hook, Stitch & Give - its THAT BAD!). However, those 6 little hexies called to me from my WIP basket. I needed to do something with them. I considered the usual pillows, bags, etc, but nothing really called to me. Until Mac the Labradoodle kindly left a stick in the studio and these little beauts were born. They follow the puff stitch hexagon pattern and then I simply sewed them onto a stick, added tassles and stuck them up. Easy peasy. They are currently hanging above my sofa looking very fetching and not on the woodshed door as pictured ;). - Yarn deliveries are happening almost daily in preparation for a busy few months of designing. I am working almost exclusively on garments, which what I really love designing and making. I know I say this about EVERYTHING, but the one I am working on at the moment is probably my favourite design to date. - Also arrived is Shirley Paden's excellent Knitwear Design Workshop. I have taken her Craftsy class, which was great and the book really goes into the math side of design (which I love). - My Woolfest purchases were modest in the first place, but Mac the dog got ahold of my hank of gorgeous Ripples Craft 100% BFL (easily my current favourite yarn) in Stormy Seas. I have put the very tangled hank in a cupboard awaiting a visit from my father in law, who is Kat Goldin Design's cheif yarn-untangler. - There are exciting things afoot for The Crochet Project. In advance of Issue 3, Issue 1 is getting a re-release with charts and schematics as well as a UK version. I will be uploading patterns tonight, so watch this space! Of things to keep me up at night, a tea cosy was never on my list. But a few months ago, that was precisely what happened as I tossed and turned over how to get the look in stranded crochet that Knit Now editor Kate had asked for. Colour work is my favourite thing in knitting, so it makes sense that I would want to use it in crochet. 1. Colourwork is normally worked in UK double crochet (US single). Insert hook into stitch, yo, pull through, yo with colour B and pull through. 3. As you work along the row, you carry the unused colour through the stitches and work over it. 1. If the item is worked in the round, the colours are solid, but there is a tell tale right bias to the stitches. Despite every effort to straighten this, when I do colourwork, my squares are noticeably trapezoidal. 2. If worked in rows, the carried yarn usually shows through the stitches, which creates a slightly muddied effect. 3. No matter if working in the round or in rows, anywhere there is just 1 stitch of a colour on its own, it is often very untidy. Now, I have tried lots of technique to resolve these issues. When working in rounds, I have followed this tutorial of stranding the yarn behind and using tight round joins. In rows, I have tried to keep the yarn to the wrong side as much as possible. Or, like in Lessons in Geometry, I have worked the carried yarn issue into the design to create a woven effect. And the Bunting Blanket from Crochet at Play is designed so only the white is carried through adding to the clarity (but you can still see the white peeping through). However, none of these would solve my tea cozy problem...and so I laid awake. I wanted the clean lines of rows with the solid look of rounds. After making 2 tea cosies - one in rows, one in rounds, I still wasn't happy. At the suggestion of Joanne, I tried working in the BLO and finally I could sleep. Not only did this simple change mean that I could eliminate the bias, but it also meant single stitches were much cleaner on their own. 1. Work up to the last stitch of the current colour. 4. Yarn over with new colour and pull through with new colour. And so, Swiss Cross Tea Cozy was born. No bias, limited yarn showing through and nice clean lines. You can buy the pattern in Knit Now's Quick and Easy Crochet Summer Issue.